A recent fro nt-page Democrat and Chronicle article on student activism spotlights Rochester Students for Social Justice, a local student activist group. The group was founded last summer by University of Rochester senior and Take 5 scholar Alykhan Alani, an International Health and Society Major and Women’s Studies minor. It includes students from many of the colleges and universities in the Rochester area. 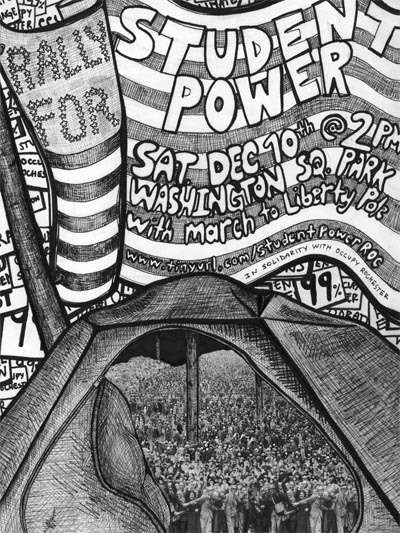 Rochester Students for Social Justice helped organize a December 10th Student Power March and Rally with the goal of uniting college activists and building coalitions between and among student groups and the Occupy movement. The rally was also meant to show the group’s support of International Human Rights Day, keeping in mind the idea that access to quality and affordable education is a human right. 75 activists, many of them students, joined the march and rally. The well-attended event brought student activism to the headlines in Rochester and is a centerpiece of the Democrat and Chronicle article, which examines the rising visibility of activism and political consciousness on college campuses. The article draws connections between the reinvigorated and increasingly political work of student groups today with the type of activism that was happening on campuses during the 1960s, drawing on the work of student groups in Rochester and Geneseo as evidence of this spark. According to the pre-event press release from Rochester Students for Social Justice, the group would like to see a stronger focus on social, economic, and environmental justice (credit willie). They are hopeful about a future that includes young adults and students working together to make positive social change with what they’ve learned in the classroom. Rochester Students for Social Justice is a pan-collegiate coalition of progressive student activists in the Rochester area. Founded in the summer of 2011, it strives to engage students and their communities in advocating for, and collectively organizing around issues of social, environmental, and economic justice. 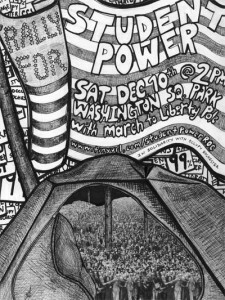 This entry was posted in Community, News and tagged #Activism, #calltoaction, #occupy, #social justice. Bookmark the permalink.